Did you know that April is National Poetry Month? Did you also know that that’s OUR FAVORITE MONTH?! As part of our month long celebration, we’ll be hosting an Open Mic poetry event at Old Capitol Books on April 11th. Hosted by local poets, Jeffrey Erwin and Kenny Garcia, come hear the work of local poets, new and established. We’ll also be running a DIY poetry writing workshop earlier in the day and encouraging people to read their newest creations. April is the cruelest month (I think some fool said that once), but you can liven it up with some poetry – your own! Come write your own poetry in a super fun writing workshop led by Jeff & Kenny. Then stick around and read your poetry at our NaPoMo Open Mic! As part of our month long celebration, we’ll be hosting an Open Mic poetry event at Old Capitol Books on April 11th. 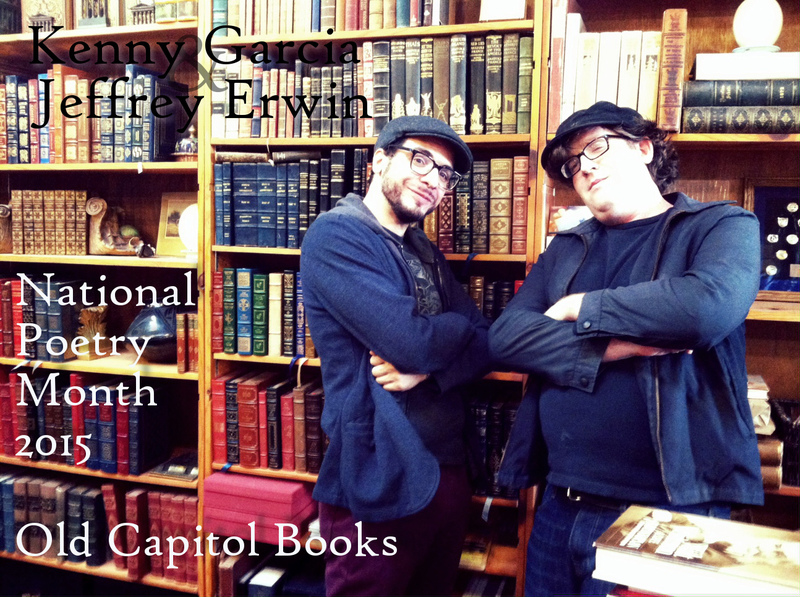 Hosted by local poets, Jeffrey Erwin and Kenny Garcia, come hear the work of local poets, new and established. Come for either event or for both! We’re not interested in charging, so all you need to bring is your journal, a pen, and your passion for poetry! Jeffrey Erwin is a poet, writer, and librarian. He received a Master of Fine Arts in Poetics from New College of California in 2004, and is occasionally published. Sometimes, at midnight, he bursts out of bed and writes poems in a reverie of vertiginous lucidity. Kenny Garcia was born and raised in New York City. Influenced by hip-hop music, slam poets, and Langston Hughes, Kenny has performed his poetry in Binghamton, New York City, Detroit, and Palestine. He has workshopped his poetry at Voices of our Nation Arts (VONA) writing workshops. Kenny graduated from SUNY-Binghamton with a degree in History and English-Creative Writing. He currently works as a librarian at CSU-Monterey Bay.